The paper presents an integrated design approach of composite bay door with pre-deformation and variable thickness optimization. Firstly, design and optimization of functional composite curved surface are discussed. To avoid adopting locking mechanism, a design of pre-deformation is used in aircraft bay door to keep the door closed. In this paper, the curve of composite bay door is considered as part of design variables. By means of the internal forces caused by the deformation of curve, the aircraft bay door could be able to fix in target position firmly and stably. The pre-deformation of bay door is controlled by particular parametric Bezier curve, which provides abundant changing range to meet the needs. Secondly, the variable thickness optimization of composite laminates is introduced. To take full advantage of designability of composites, variable thickness design is actualized through partitioning in bay door, not only considering the weight reduction of the structure, but also ensuring the enough strength and stiffness in the critical load positions where the strength and stiffness requirements are harsh. 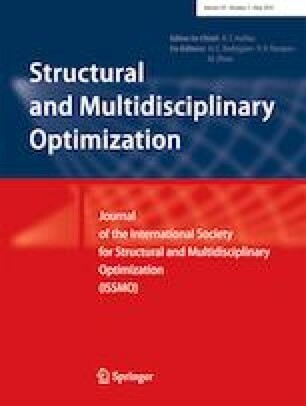 Furthermore, the integrated optimization is carried out based on the method of concurrent subspace optimization (CSSO). The work is supported by the National Key Research and Development Program (No. 2016YFB0200700), the National Nature Science Foundation of the P.R. China (No. 11872089, No. 11572024, No. 11432002), and the Defense Industrial Technology Development Program (No. JCKY2017601B001, No. JCKY2016601B001) for the financial supports.